Honestly, it really did. For the first five days, we were unable to print out anything because the poor thing didn't know where it was. I felt sorry for it initially, because we've all been there. You know those days where you get up in the morning, look around your bedroom and just think "Where actually am I right now...how did I get here?" Obviously, you know where you are literally. You're probably in North London somewhere, and you got there on the tube. I'm talking spiritually. Where are you? I imagine this is the kind of thought process that our little printer went through in its first week. It arrived, got dumped in an office opposite Victoria Station, scared and alone. Perhaps it knew where it was physically, but its emotional state must've been all over the shop. So, really, it shouldn't have been too much of a surprise when the I.T man informed us that the printer simply didn't know where it was. It just couldn't cope. However, now it's week 4 and it still hasn't settled. I'm losing patience. I won't lie, I didn't think my capacity for empathy would be pushed to the brink by a printer. I can tell it's trying. Sometimes it does its job with no issue, but not today. Today we went one step beyond it not knowing its spiritual whereabouts. Today it didn't think it existed at all. ...I have really tiny hands, I know this already. There I was, simply wanting to print a copy of my work and suddenly I'm hit with this message: "The printer does not exist." Oh dear. This is getting serious now. I mean, I haven't looked too far into the logistical possibilities of therapy for machines, but it might be the only option. Maybe the printer just needs someone to talk to? Anyway, for the time being at least, it looks like we're stuck with it being emotionally unstable. 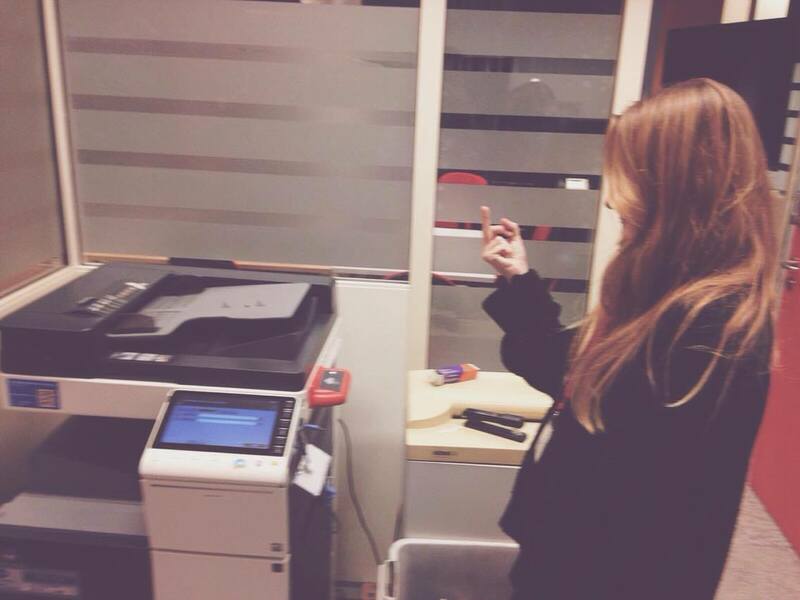 Printer I have faith in you. You can do this. You do exist.